Heavy-duty, freestanding inserts protect from static electrical charges. Transport and store highly charged powders, flakes, and granules. Seamless design is completely leakproof. 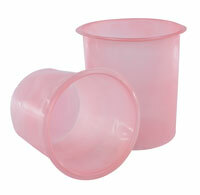 Snug contour lip prevents leakage between insert and lip. Use of inserts extends life of drum.